The worldwide energy recovery ventilators market has been witnessing a tremendous rise in its valuation, thanks to the growing concerns among consumers regarding indoor environmental quality. The rising awareness about the benefits of innovative energy recovery ventilators, such as enhanced internal air quality without consuming much energy, is also adding to the growth of this market substantially. On the other hand, the high cost associated with these ventilators may act as a hindrance to the market’s growth in the near future. However, the increase in research and developments and consequent product differentiation will minimize its effect on this market over the forthcoming years. The opportunity in the global market for energy recovery ventilators, which stood at US$1.82 bn in 2015, is likely to expand at a CAGR of 11.50% during the period from 2016 to 2024 and reach a value of US$4.84 bn by 2024. In terms of volume, the market is expected to expand at an impressive CAGR of 10.20% between 2016 and 2024. Energy recovery ventilators find significant application in the commercial, industrial, and the residential sectors. In terms of revenue, the market has been led by the industrial sector and is expected to remain so over the forthcoming years. In 2015, this segment acquired more than 38% of the overall market. The increasing awareness regarding the working conditions and the employee welfare is leading to the high adoption of energy recovery ventilators across industries, resulting in the dominance of the industrial sector. However, in terms of volume, the demand for energy recovery ventilators from the commercial sector. Analysts expect this segment to retain its position over the years to come, thanks to the growing concerns of consumers pertaining to the poor quality of air at public places and stores. Geographically, the worldwide market for energy recovery ventilators has been classified into Europe, Asia Pacific, North America, Latin America, and the Middle East and Africa. North America, among these, has been dominating this market. The high adoption rate and the presence of a large pool of energy recovery ventilators manufacturers in this region are the key factors behind its phenomenal growth. In addition to this, the implementation of numerous norms and policies related to air quality management is likely to boost this regional market considerably in the near future. However, the maturing nature of the North America market for energy recovery ventilators may limit its growth to some extent, giving away the top position to Europe over the forthcoming years. The Asia Pacific market for energy recovery ventilators is also expected to gain considerable impetus in the years to come. 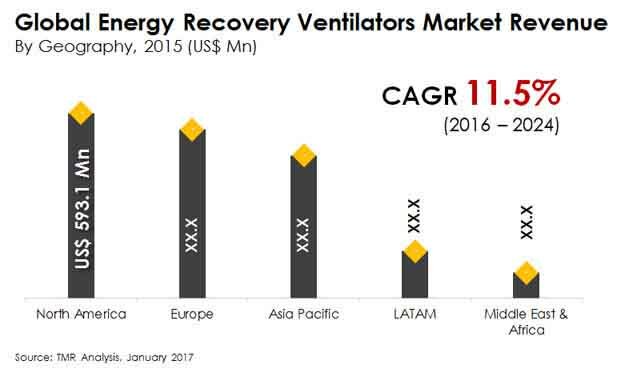 The global market for energy recovering ventilators demonstrates a fragmented competitive landscape. United Technologies Corp., Fujitsu Ltd., LG Electronics., Munters Corp., and Daikin industries Ltd. are the leading players in this market. Some of the other prominent players are Mitsubishi Electric Corp. Ltd., Nortek Inc., Johnson Controls International Plc., Blue Star Ltd., and Airxchange Inc. The study provides a decisive view of the energy recovery ventilators market by segmenting it based on technology, type, application, and regional demand. Application segments have been analyzed based on current trends and future potential. The market has been estimated from 2016 to 2024 in terms of volume (Million Units) and revenue (US$ Mn). Regional segmentation includes the current and forecast demand for North America, Europe, Asia Pacific, Latin America, and the Middle East and Africa. These have been further sub-segmented into countries and regions with relevance to the market. The segmentation also includes demand for individual applications in all regions. The study covers the drivers and restraints governing the dynamics of the market along with their impact on demand during the forecast period. Additionally, the report includes potential opportunities in the energy recovery ventilators market on the global and regional level. It encompasses market attractiveness analysis, wherein applications have been benchmarked based on their market size, growth rate, and general attractiveness for future growth. The market has been forecast based on constant currency rates. Prices of energy recovery ventilators vary in each region and are a result of the demand-supply scenario in the region. Hence, a similar volume-to-revenue ratio does not follow for each individual region. Individual pricing of energy recovery ventilators for each application has been taken into account while estimating and forecasting market revenue on a global basis. Regional average price has been considered while breaking down the market into segments in each region. The report provides the size of the energy recovery ventilators market in 2015 and the forecast for the next nine years up to 2024. The size of the global energy recovery ventilators market is provided in terms of both volume and revenue. Market volume is defined in million units, while market revenue for regions is in US$ Mn. The market size and forecast for each product segment is provided in the context of global and regional markets. Numbers provided in this report are derived based on demand generated from different applications and types of raw materials. Market estimates for this study have been based on volume, with revenue being derived through regional pricing trends. The price for commonly utilized grades of energy recovery ventilators in each application has been considered, and customized product pricing has not been included. Demand for energy recovery ventilators has been derived by analyzing the global and regional demand for energy recovery ventilators in each application. The global energy recovery ventilators market has been analyzed based on expected demand. Market data for each segment is based on volume and corresponding revenues. Prices considered for calculation of revenue are average regional prices obtained through primary quotes from numerous regional suppliers, distributors, and direct selling regional producers based on manufacturers’ feedback. Forecasts have been based on the expected demand from energy recovery ventilators. We have used the top-down approach to estimate the global energy recovery ventilators market, split into regions. The product type split of the market has been derived using a top-down approach for each regional market separately, with the global product type segment split being an integration of regional estimates. Companies were considered for the market share analysis based on their product portfolio, revenue, and manufacturing capacity. In the absence of specific data related to the sales of energy recovery ventilators of several privately held companies, calculated assumptions have been made in view of the company’s product portfolio and regional presence along with the demand for products in its portfolio. The report covers a detailed competitive outlook that includes market share and company profiles of key players operating in the global market. Key players profiled in the report include Mitsubishi Electric Corporation Ltd. (Japan), Daikin industries Ltd. (Japan), United Technologies Corporation (U.S.), FUJITSU Ltd. (Japan), Nortek, Inc. (U.S.), LG Electronics (South Korea), Johnson Controls International PLC (Ireland), Blue Star Ltd. (India), Airxchange Inc. (U.S.), and Munters Corporation (Sweden).